ICRA Lanka Limited, subsidiary of ICRA Limited, a group company of Moody’s Investors Service, has reaffirmed the issuer rating of [SL]A- (pronounced SL A minus) with stable outlook for First Capital Holdings PLC (FCH or the company). ICRA Lanka has also reaffirmed the issue rating of [SL]A- (pronounced SL A minus) with stable outlook for the LKR 314.6 Mn type B and type C senior unsecured redeemable debenture programme of the company. ICRA Lanka has withdrawn the issue rating of [SL]A- (pronounced SL A minus) with stable outlook for the LKR 185.4 Mn type A senior unsecured redeemable debenture programme, at the request of the company, as the instrument is fully redeemed and there is no amount outstanding against the rated instrument. ICRA Lanka has also reaffirmed the [SL]A2+ (pronounced SL A two plus) rating to the LKR 1,500 Mn commercial paper programme of FCH. The ratings factor in FCH’s status as the holding company of First Capital Treasuries PLC (FCT), a leading standalone primary dealer in Sri Lanka (Issuer rating of [SL]A- with stable outlook). The company is also the holding company for other entities in the financial services space, however FCT accounts for 70% of the consolidated assets and 80% of the consolidated net trading income of FCH for FY2017. As observed in the past, FCH’s standalone performance is dependent on the performance of FCT. Thus, FCH’s performance is expected to be susceptible to the risks inherent to FCT. The ratings take note of FCH’s efforts to expand the business and financial performances of the other subsidiaries, which are engaged in corporate debt structuring, corporate finance, asset management, stock broking, extending margin trading facilities and trustee services; however their scale of operations continues to remain moderate. FCH’s borrowings are largely short term in nature and are used for investment and lending to group entities. The rating factors the FCH group’s established relationships with banks and financial institutions, providing access to funding. Further, ICRA Lanka expects timely funding support from FCT, considering the liquid nature of its assets. FCH, being a holding company derives its income from the dividends from the group entities and income from its investments, which includes interest income and profit from investments. For the FY2017 stand-alone income from investment activities improved (LKR 774 Mn total income in FY2017 vis-a-vis LKR 336 Mn in FY2016), while the share of profit from Subsidiaries1 increased steeply (LKR 194 Mn in FY2017 vis-à-vis 14 Mn in FY2016). The company’s stand-alone funding profile is characterised largely by short term funding (commercial papers and bank borrowings), which accounted for close to 90% of the total standalone debt as on June 30, 2017 while the remaining was in the form of long term loans and debentures. FCH’s asset profile (standalone) largely consists of short term loan funding to its group entities, largely to First Capital Limited (FCL). The company’s standalone gearing has moderated to about 3.37 times as on June 30, 2017 vis-à-vis 3.78 times as on March 31, 2017. ICRA takes comfort from FCH’ access to the sanctioned bank lines, which has improved over the period and the highly liquid nature of FCT’s assets, provides comfort from a liquidity perspective. First Capital Limited (FCL), which is 99.9% held by FCH, is involved in corporate debt structuring, corporate finance advisory services and investments, reported a total fee income of LKR 42 Mn in FY2017 (111 Mn in FY2016) from transaction advisory activities and the company also generated about LKR 1.6 Bn investment income from proprietary lending and investment activities done at FCL level. FCL is the holding company for the other entities in the FCH group including, First Capital Asset Management Limited (FCAM), a licensed Investment Manager and licensed Managing Company for Unit Trusts by the Securities and Exchange Commission, First Capital Markets Limited (FCM), which is involved in providing margin trading facilities and dealing and broking of listed debt, First Capital Equities (Pvt) Limited (FCE), which is engaged in stock broking activities and the newly formed First Capital Trustee Services (Pvt) Limited (FCTS). FCAM reported income of LKR 38 Mn on a total AUM of about LKR 3.0 Bn in FY2017 as compared with LKR 56 Mn on a total AUM of about LKR 5.4. Bn in FY2016. FCM reported a total income of LKR 70Mn (LKR 56 Mn in FY2016) and FCE reported a total income of LKR 47 Mn (LKR 56 Mn in FY2016) in FY2017. Profits from other business units (non-primary dealer) continued to remain subdued, and FCH group profitability continues to be driven by the primary dealer; FCT accounted for about 80% of the group net trading income in FY2017. Incorporated in year 1992, FCH is a public limited company listed on the Colombo Stock Exchange. FCH is the holding company for the financial services businesses of Dunamis Capital PLC, which holds 78.1% in FCH. The company is engaged in making investments and managing its subsidiaries i.e. 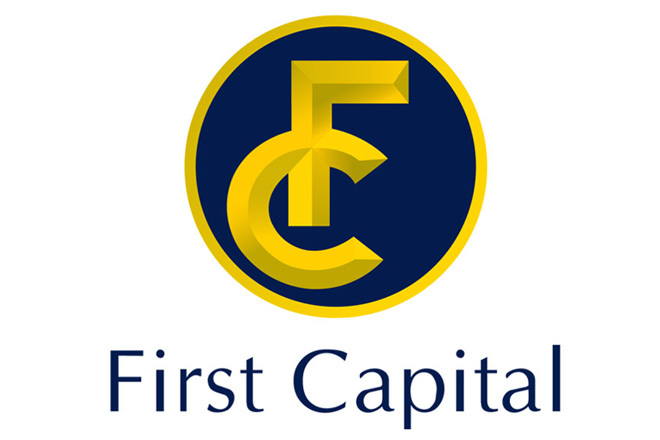 First Capital Treasuries PLC (FCT) which is an authorised Primary Dealer in Government Securities, First Capital Limited (FCL) involved in structuring and placement of corporate debt and corporate finance advisory services and investments, First Capital Asset Management Limited (FCAM) involved in unit trust and portfolio management; First Capital Markets Limited (FCM) involved in providing margin trading facilities and dealing and broking of listed debts, First Capital Trustee Services (Pvt) Limited (FCTS) which is a trustee services provider for corporate debt securities and First Capital Equities (Pvt) Limited (FCE) which is engaged in stock broking activities. During FY2017, FCH reported a consolidated net profit of LKR 232 Mn on a total asset base of LKR 31.7 Bn as compared to a net profit of LKR 47 Mn on a total asset base of LKR 20.8 Bn in the previous fiscal year.